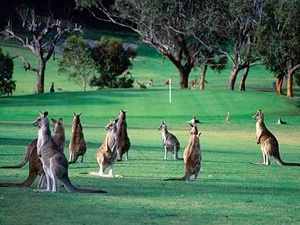 A Herald Sun article reports (18th Sept, 2015) that the RACV Cape Schanck Resort “had received complaints from residents and golf guests about the threatening behaviour of a small mob of kangaroos on the course”. However, the resort didn’t know one of its staff members had been shooting them, and ordered all activity to stop. A local resident was startled recently when he saw a kangaroo bound out of the bush in front him, followed by a pair of “hunters”. He said “two guys come out of the bush with this big rifle, with a scope, stand and silencer on its end”. These gun-totting, ego-driven, self-style game “hunters” escaped – “as they saw us they got a bit sheepish, jumped in a buggy and drove off.”! The local resident complained to the resort, and he was told they had permission to shoot a number of kangaroos on the course because there had been an “attack”. “A dog that wasn’t on a lead had been attacked because it chased one of the roos, so maybe that’s where the complaint came from, but that’s not the kangaroo’s fault”. This “attack” is really due to a startled and threatened kangaroo, being self-defensive against a dog, illegally off leash in the golf course! “As far as I’m aware they’ve never hurt anybody. They’re actually very friendly“, says the witness. It turns out, according to the RACV southern resorts general manager Mark Bennetts, that the permit was obtained by a staff member without authorisation. Such is the ease of obtaining permits to “control” wildlife in Victoria, where they distribute ATCW permits like lollies! As soon as RACV management was advised, a directive to cease all activity was immediately issued. Luckily, no kangaroos were harmed. This is typical of the red-neck attitude we’ve inherited from the Colonial era – shoot, cut down and destroy! We need to love and learn to live with our endemic wildlife and stop the mentality that everything that moves must be destroyed, as it might be a threat – even without evidence! Please see below information passed to me on some very disturbing behaviour that occurred today (17th Sept) by the RACV at Cape Schanck. 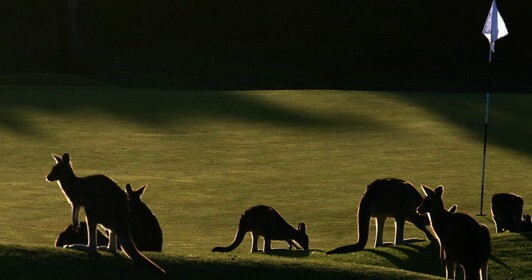 Why is the RACV killing native kangaroos on the Cape Schanck Golf Resort? Why are they hiring shooters with rifles and silencers and allowing this on a residential resort, with the obvious safety issues that raises? Are these shooters licensed as kangaroo hunters or not? Does the MPSC know about and approve of or condone this behaviour? If as they say they “have permission” to carry out such a kill, who gave it and under what conditions? It at least needs some serious investigation. At 6.57am today [Thursday 17 Sept], my wife and I were walking our dog and a friend’s on the 3rd hole of the RACV course when we saw, not unusually, one of what we believe to be three kangaroos. This one was belting along the tree line east to west on the south side of the fairway and proceeded to Trent Jones Drive, then south across the 4th and into the bush bordering Cape Schanck Road along the 5th hole. Then we saw two men emerge from the bushes where the 3rd and 4th holes blend. One had a large rifle with telescopic sights, a bipod and a very large silencer. They got into a John Deere golf-club utility type vehicle and we heard them drive off in the direction of the workshops. We are convinced they had shot at, and may have hit, the kangaroo. We went to the pro shop and reported the incident and telephoned Rosebud Police likewise. RACV rang back and said they has permission to kill the three kangaroos because there “had been an attack”. I queried the veracity of this attack. The person was very vague. I had heard that a dog, not on a lead, had been attacked somewhere because it chased a kangaroo near the Casuarina/Trent Jones Drive intersection some months ago. It is not inconceivable that its owner may have been threatened coming to the dog’s aid. These kangaroos are protected in principle and are harmless in practice. We see them, up close and personal, almost daily. We know of people who leave their gates open (backing on to Harwood) to let them in and out of their property when their children are playing. It is a ridiculous overkill – excuse the pun – to get a permit, and have a man with a bloody big gun with a silencer, 20 metres from houses in the post-dawn hours, trying to shoot three kangaroos who don’t harm anyone. They should have shot the dog and not the harassed kangaroos. Shooting kangaroos in this instance and for this reason is committing a crime!